Redesigned to do more on the job while requiring less from the operator, the CASE compact wheel loaders work with confidence and power on every jobsite. The Versa-Boom linkage and ride control option add versatility and performance capacities. A stronger, more compact frame improves stability for greater leverage and load control. 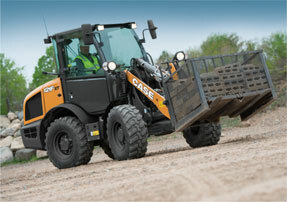 CASE compact wheel loaders utilize Particulate Matter Catalyst and DOC technology to meet Tier 4 final emission standards. With no extra fluid to add and no filters to replace, you can get right to work.